Please CLICK HERE to read a copy of the letter from the Ofsted Inspector following his inspection of the school on 18 September 2018. You will see that the School continues to be good. The Inspector notes that the leadership team has maintained the good quality of education in the school since the last inspection, and that all the changes that have taken place over the last 4 years have been responded to positively by leaders and governors. The credit for this goes first and foremost to the leadership team and in particular to the Head Teacher, Nicola Doyle. The School's governors, under the Chairmanship of Father Gillean Craig also take credit for their work in reviewing and monitoring all aspects of the school, the curriculum, safeguarding, finance and special educational needs. 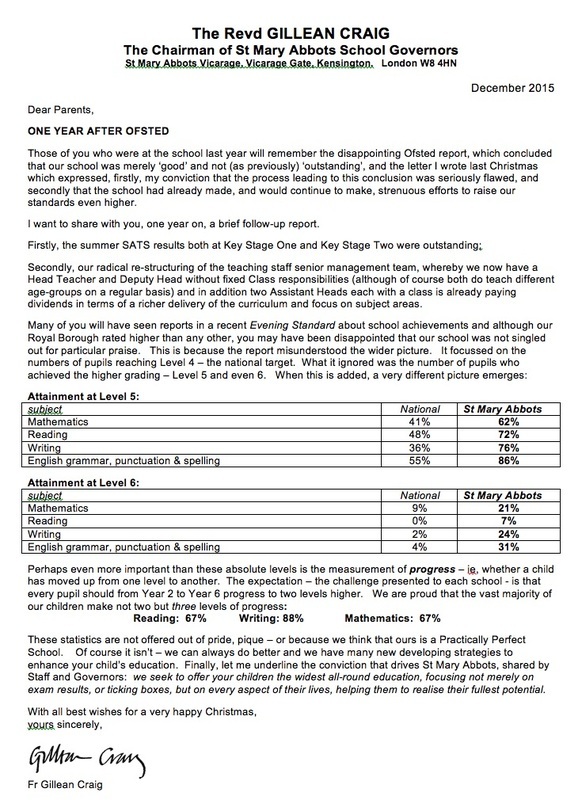 The senior leadership team and the governors will continue to seek to raise standards and to ensure that the children are happy and safe at the School, and in particular that the ethos of the School continues to be underpinned by its Christian faith as identified by the Inspector in his report.